Axis looks like a tall and slim half-elf, with little black horns curving backwards from his forehead. His skin has the paleness of death, and his long hair is a pearly white-silver. His eyes are completely black, and when angered they glow like burning coal. He doesn't wear much jewelery: a delicate white gold and platinum circlet with saphires of clearly elven craftsmanship, a simple silver and pearl earring, the signet ring of the Vannya family and a silver ring with a row of small diamonds. He always has the ebon holy simbol of Freya his long dead mother gave him when he was little as a necklace, alongside a carved medallion of blessed mahogany. 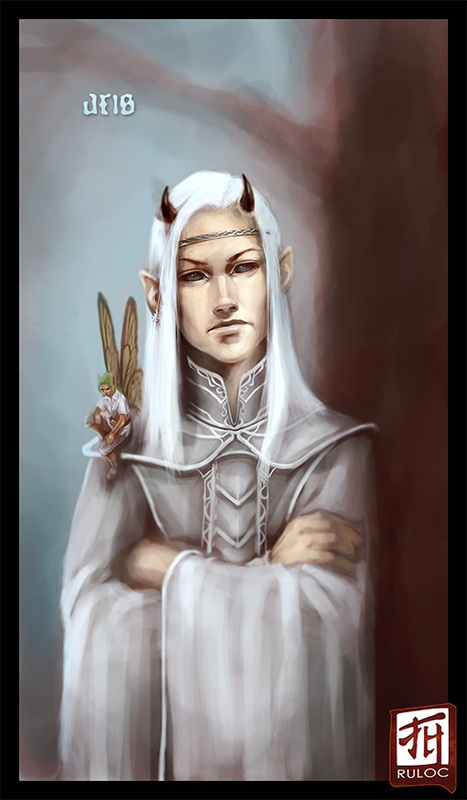 He wears elegant elvencrafted court finery of pure white with silver embroidery of leaves and butterflies. His familiar Cernan (a lyrakien azata) is never far from him, usually sitting on his shoulder, perching on his head or resting in his backpack. Cernan has dark skin, bright green hair in a ponytail, solid golden eyes and wings resembling those of a queen alexandra's birdwing. He wears a short linen tunic and white leather pants. I became a fan of your art just after seeing the first post of this blog. Please keep up the good works! !